On behalf of Nestle Nutrition we would like to invite you to attend a special scientific lecture to take place during JFHC Live 2014. 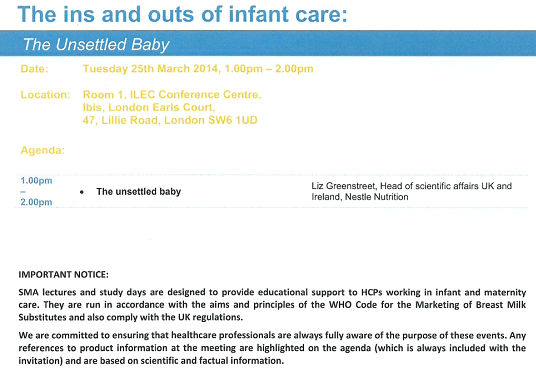 This lecture has been specifically designed for healthcare professionals with a special interest in infant care. Nestle are delighted to present Liz Greenstreet, Head of medical and scientific affairs UK and Ireland, Nestle Nutrition, who will present the lecture. The breakout seminar will be an excellent way to meet and network with colleagues from other centres in your area. Please email: Toni.Preston@UK.Nestle.com and Paul.Ohara@pavpub.com if you have any queries about this seminar. We hope you will be able to join us for what will be an informative and thought-provoking session.